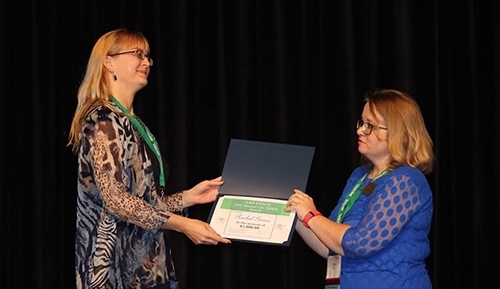 Rachel Gerner, left, receives the master's student award from Tricia Kerr, ARKTESOL president. Rachel Gerner will begin her master's thesis research in the spring semester at the University of Arkansas with a boost from the Arkansas Teachers of English to Speakers of Other Languages. She was awarded the 2017 ARKTESOL master's student award, which will pay $1,000 upon completion of her research project. Gerner was one of several U of A students and faculty members who attended the 18th annual ARKTESOL Conference in Hot Springs earlier this month. The award is intended to help graduate students develop projects with direct application to ESOL. Gerner will collaborate with Della Adams, another U of A master's student in TESOL, who also works as an ESL teacher with the Ozark Literacy Council. They will prepare project-based professional development materials for use by Ozark Literacy Council teachers who are part of Upward Academy. It's a program that offers classes in English to Tyson Foods employees working toward citizenship or general equivalency diplomas. Plant workers can take classes before and after their shifts, with several time slots available beginning at 5 a.m. and going until 10:30 p.m.
"I taught English for three years in China," Gerner said. "I'm passionate about adult education in the field of second-language acquisition and professional development for teachers." She plans to graduate with her master's degree in May and wants to teach English overseas again. "The Ozark Literacy Council has been very supportive of our research," Gerner said. "They are doing innovative work in literacy." The recipient of the master's student award must present results of the research project at a future ARKTESOL conference, which Gerner plans to do in the fall of 2018.